Intel’s Haswell-EP Xeons with DDR3 and DDR4 on the Horizon? Johan’s awesome overview of the Haswell-EP ecosystem showed that the server processor line from Intel is firmly in the track for DDR4 memory along with the associated benefits of lower power consumption, higher absolute frequencies and higher capacity modules. At that point, we all assumed that all Haswell-EP Xeons using the LGA2011-3 socket were DDR4 only, requiring each new CPU to be used with the newer generation modules. However thanks to ASRock’s server team, ASRock Rack, it would seem that there will be some Xeons for sale from Intel with both DDR3 and DDR4 support. 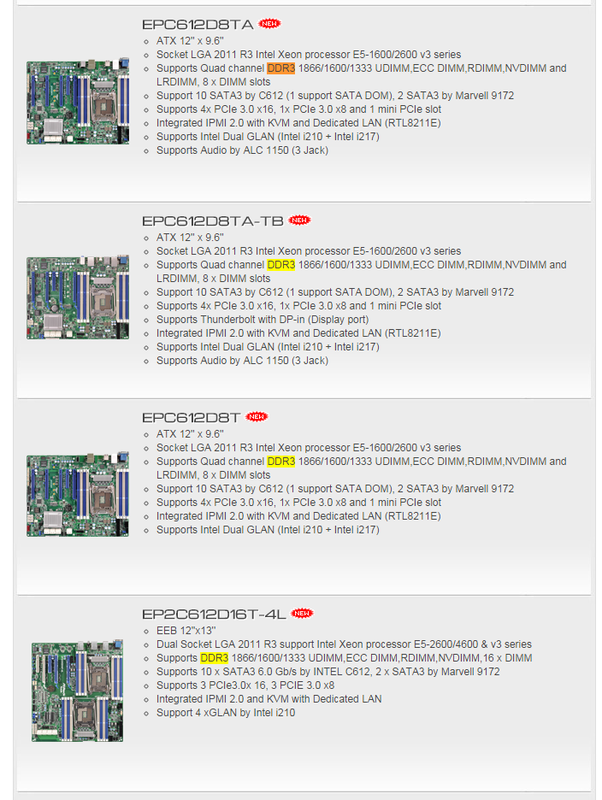 At the current time there is no release date or pricing for these DDR3 Haswell-EP processors, however it would seem that ASRock Rack is shipping these motherboards to distributors already, meaning that Intel cannot be far behind. It does offer a server team the ability to reuse the expensive DDR3 memory they already have, especially given the DDR4 premium, although the processor counts are limited. CPU-World suggested that these processors have dual memory controllers, and we recieved confirmation that this is true. This could suggest that all Xeons have dual memory controllers but with DDR3 disabled. Note that these motherboards would reject a DDR4-only CPU as a result of their layout. It does potentially pave the way for combination DDR3/DDR4 based LGA2011-3 motherboards in the future. We have also been told that the minimum order quantity for these CPUs might be higher than average, and thus server admins will have to contact their Intel distribution network for exact numbers. This might put a halt on smaller configurations keeping their DDR3. Additional (9/25): We have been asked to make clear that these CPUs will not be on general sale for end-users. Only those companies with large minimum-order-quantities will be able to obtain the CPUs, and as a result these motherboards might find their way into complete servers only, rather than be up for sale individually. These are off-roadmap processors, not intended for general release. Yes and no, because LGA775 was a different thing technically, because memory controller was in the chipset north bridge (VIA PT880 Pro/Ultra in your case), and not in the CPU there (I silently assumed CPUs with the integrated memory controller, but did not mention it in the post).